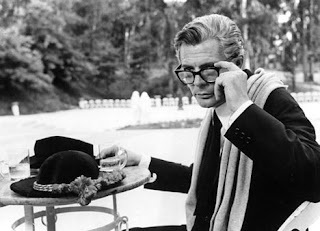 8 ½. This deeply autobiographical movie wasn’t just the legendary Italian New Wave director Federico Fellini’s magnum opus, but also one of the landmark movies in the history of cinema. So-called superficial elements like plot, chronology and the literary equivalent of space-time duality have been completely done away with. Instead what we have is a series of montages that blur in and out of reality. Guido, Fellini’s alter-ego and gloriously played by Marcello Mastroianni, is a famous filmmaker; unfortunately, on the eve of his grandest venture thus far, he starts developing a terrible case of director’s block. Further, he is at the cross-roads of his material relationships – be it with his wife or his mistress, he feels trapped in a world filled with buffoonish intellectuals, and his complex sense of guilt (especially those concerning his Catholic belief) are tearing out of his finely managed façade of existentialism and detachment. Thus what we have is an extravagantly surreal and immensely psycho-analytical thesis filled with elaborate dream sequences, flashbacks and the present, which are all ultimately brought together in a jangled and phantasmic mass of “what could have been”, “what ought to have been”, and “what is”. I would however be very cautious while recommending this movie for the simple reason that very few people would have the openness of mind and, I daresay, courage to actually sit through and enjoy it. The movie is slow, it is quirky, it is illusory, it is fantasy-laden, it is delirious, it is philosophical, it is disconcerting, it is even disparaging at times, but it is also unique and splendid. p.s. My recent review of the film can be found here. We watched all 20 minutes of this a long time ago and couldn't go through with it. The fact that it had no plot put us off completely. Maybe we're not intelligent enough to see the underlying purpose of it before but reading your review, we're gonna give it another go when we come upon it again. Isn't narrative the life of a movie though? Maybe we're just not smart enough for these kind of movies. The French New Wave have never been our biggest love. '400 Blows' was cool but movies by directors like Godard and Fellini feel out of reach in terms of comprehension for us. You and a lot of people seem to adore them however, and for that reason we're feeling really left out. Like the whole world knows this incredible secret and we're the only ones out of the loop. Fellini wasn't a part of the French New Wave for the simple reason that he was an Italian. I feel you have mixed up between plot and narrative. I'm no film student; however I strongly feel that these are two distinct parameters altogether. A movie need not necessarily be plot-driven. It can be character-driven. The same holds for literature as well. For instance, right now I'm reading a book called On The Road by Jack Kerouac. It is an astonishing work of art, but is completely devoid of any conventional plot elements. There are loads of terrific movies that are solely character-driven like Chungking Express and Taxi Driver. As for narrative, even though it is usually used interchangeably with plot, I feel it represents the way the film is told by the director with all its intricacies, subtleties and ambiguities. And in that regard, 8 1/2, sure does have a whimsical, delirious and bitterly satiric narrative. If I'm allowed to use a fancy phrase, it has a Stream of Consciousness kind of narrative. Or perhaps, using a different parlance, it is more akin to nonsense verses, which, through their apparent fun, present something more profound. I feel one just needs to have an open mind to view these kinds of movies. Honestly speaking, I too was quite daunted before watching it and had been postponing viewing it for quite sometime. Then one fine day I decided to take the plunge and had a completely different kind of experience vis-a-vis perhaps a movie by Tarantino or Scorcese. I absolutely do not agree with your view that just because I have liked a Fellini or a Godard places me on a higher pedestal. I frequently visit your blog, and my experience of that tells me you are as discerning a cinephile as anyone ought to be or can aspire to be. Going back to a statement you'd once made, it is a classic case of apples and oranges. Our likings (or dislikings) and opinions might not match at times, but at the end of the day we are both cinema lovers, and I guess, that's the long and short of it. Anyway, we believe you can gauge our understanding of Fellini or Godard by this silly faux pax alone. We appreciate the informative reply given by you very much. It's just that our love for movies is centered mostly on the story aspect. Therefore, we might not delve into a Fellini or Godard feature anytime soon. It might take us awhile, but we'll take your recommendation one day. Fingers crossed.